A World War II veteran and a paraplegic, 80 year old Robert Pendley and his wife were stabbed and beaten to death outside their home by McElmurry and his wife. Some weeks before they died, the couple hired a man to clear some land so they could see the sunset better. At one point the man came to work along with two people who had been living with him, Harold and Vickie McElmurry. The Pendleys put them to work as well. Several weeks after the work was done, the McElmurrys returned. After spending two days walking through the woods to reach the Pendley home, they visited with the elderly couple, then retreated to the woods. According to McElmurry, he and his wife "shot up" with methamphetamine while trying to decide whether to rob and kill the Pendleys or simply rob them. They returned to the home, finding the elderly couple in the garage. While Vickie McElmurry lured Vivian Pendley away, Harold McElmurry attacked Robert Pendley, stabbing him multiple times with a pair of scissors before beating him with garden instruments and a pipe.Vivian Pendley was also beaten and stabbed to death by McElmurry while his wife held her. The McElmurrys fled with two pistols, $70 cash and the Pendleys' 12-year-old Oldsmobile, crossing the border into Mexico for several days. They were captured when crossing back into the United States near Laredo, Texas, and returned to Oklahoma. McElmurry had prior 1998 convictions for Grand Larceny and Receiving Stolen Property. He waived all appeals of his death sentence. Accomplice Vicki McElmurry was also convicted and sentenced to life in prison. McElmurry v. State, 60 P.3d 4 (Okla.Crim.App. 2002). "I'd like to say I'm sorry to the Pendleys. I hope they can forgive me." McAlester, Okla. - A man who murdered an elderly couple who once hired him to do lawn work and odd jobs was executed by lethal injection at the state prison Tuesday night. Harold McElmurry became the 14th convicted killer put to death in Oklahoma in 2003 - second only to Texas in executions for the year. He also became the 50th condemned killer put to death in the United States in 2003. The victims, Rosa Vivien Pendley, 75, and Robert Pendley, 80, lived in Eufaula. Robert Pendley was a paraplegic and confined to a wheelchair. "I'd like to say I'm sorry to the Pendleys," McElmurry said in his last statment. "I hope they can forgive me." The lethal injection of chemicals began at 6:04 p.m. and McElmurry was pronounced dead at 6:06 p.m. For his last meal, McElmurry requested a medium pizza with Canadian bacon, a pint of chicken livers, cottage cheese and a white onion, a spokesman for the Oklahoma Department of Corrections stated. The murders occurred Aug. 2, 1999. The Pendleys were stabbed with scissors and their heads smashed in with a pipe. Harold McElmurry confessed to the murders. McElmurry's wife, Vicki, was sentenced to life in prison for her part in the slayings. Court documents stated that the couple had previously done yard work for the Pendleys. Harold McElmurry had talked of robbing and murdering the couple. He believed he was about to be arrested for a probation violation, court documents stated, and would be sent back to prison. The murderous couple actually walked two days to get to the home of the Pendleys, court documents stated. Outside the Pendley's home, the couple spent several hours discussing the murders. "I wanted to kill them but I didn't feel right about it," Harold McElmurry was quoted as stating in court documents. "I didn't care for Vivien much, but I liked Robert. Robert was real nice to me." McElmurry also stated that he and his wife injected methamphetamines while outside discussing the robbery and murders before returning to the Pendley home to slaughter the couple. Used Pipe To Finish Victims In his written statement to investigators, Harold McElmurry said he first killed Robert, using a scissors to repeatedly stab him in the chest and a hoe to strike him in the head. He later used a pipe to smash his head after discovering that Robert was still alive. As for Rosa Pendley, she was stabbed while Vicki McElmurry held her. She was also struck with a pipe. The couple stole $70, costume jewelry, the Pendley's car and a pistol. They fled to Texas and then to Mexico. The couple were arrested when they crossed the border back into the United States on Aug. 5, 1999. Harold McElmurry had previous convictions for grand larceny and concealing stolen property. McALESTER, Okla. (AP) - A man who fatally stabbed and bludgeoned an elderly couple in 1999 was executed Tuesday by injection. Harold Loyd McElmurry III asked for forgiveness just before he was put to death at the Oklahoma State Penitentiary. "I'd like to say I'm sorry to the Pendleys. I hope they can forgive me," said McElmurry, 33. He was pronounced dead two minutes later. McElmurry's wife also was convicted in the deaths of the 80-year-old paraplegic and his 75-year-old wife at their rural home near Lenna in eastern Oklahoma. McElmurry, who had done odd jobs for the couple, testified at his trial that he felt bad about killing Robert Pendley, and said the murdered man "was always real nice to me." The couple was bludgeoned with garden implements. Robert Pendley was knocked from his wheelchair, then stabbed repeatedly with scissors. Vivian Pendley tried to escape, but investigators said that McElmurry had his wife catch and hold the woman while he beat her to death. Vickie McElmurry is serving two life sentences. The McElmurrys were caught in Texas near the Mexican border in the Pendleys' car. They also had stolen two pistols and $70. Pendleys' grandson, also named Robert, said he was willing to grant McElmurry's request for forgiveness. "I think he was sincere," said the grandson, who witnessed the execution. Fourteen people have been put to death in Oklahoma this year. Attorney General Drew Edmondson requested an execution date for McIntosh County death row inmate Harold Loyd McElmurry, III. McElmurry, 33, was sentenced to death for the Aug. 2, 1999, murders of 75-year-old Rosa Vivian Pendley and 80-year-old Robert Pendley in the couple's home west of Eufaula. McElmurry told authorities he stabbed the victims with scissors and hit them with a piece of pipe and a garden hoe. McElmurry's direct appeal was denied Dec. 2, 2002, and rehearing was denied Feb. 28, 2003. McElmurry, who has indicated his desire to waive further appeals, failed to file a petition for writ of certiorari at the U.S. Supreme Court before the May 29 deadline. According to statute, Edmondson requested the date be set 30 days from May 29. The state of Oklahoma is scheduled to execute Harold McElmurry July 29 for the murders of Robert and Vivian Pendley in a rural area west of Eufaula in 1999. McElmurry, a white man, allegedly stabbed and beat the Pendleys to death outside their home while under the influence of methamphetamine, and confessed to the crimes shortly thereafter. However, his death sentence is the result of a trial tainted by prosecutorial misconduct and ineffective assistance of counsel, and the state should require a thorough review of these issues before allowing his execution to proceed. After losing his direct appeal, McElmurry failed to file a petition with the U.S. Supreme Court before the May 29 deadline, indicating a desire to waive his further appeals. His execution, if carried out July 29, will amount to little more than state-assisted suicide. During the trial, prosecutors mocked the defense and made demeaning statements toward McElmurry. At one point, the lead prosecutor sarcastically said of the defendant’s emotional disturbances: “Poor, old Harold McElmurry…I guess his dog won’t even come up to him.” Such comments are not only prejudicial in a legal sense, but also compound the psychological problems so prevalent in the prison and death penalty systems. Prosecutors also referred to mitigating factors – which, by law, should be carefully weighed with aggravating factors in the sentencing phase of the trial – as “excuses” and ridiculed the mitigating evidence in McElmurry’s case. Considering the U.S. Supreme Court issued a critical ruling (Wiggins v. Smith) just one week ago focusing on the importance of mitigating evidence in death penalty cases, this approach clearly deprives the defendant of a fair trial in the sentencing phase. Furthermore, McElmurry’s defense attorneys failed to object to the prosecutors’ demeaning and misleading statements, adding another problem – ineffective assistance of counsel – to his death sentence. McElmurry had no prior criminal history, and although his drug abuse immediately prior to the murder by no means justifies his actions, it does offer an explanation of his emotional and behavioral disturbance. Evidence revealed McElmurry and his wife, Vickie, injected methamphetamine 30 or 40 minutes before the Pendley murders. This execution date is the fifth scheduled in Oklahoma in the month of July alone. The state ranks second only to Texas in executions this year, and its excessive use of capital punishment in recent years has failed to serve in any way as a deterrent to violent crime. Please contact Gov. Brad Henry and express your concerns over Oklahoma’s use of the death penalty and protest the pending execution of Harold McElmurry. They met their killer because they wanted to see the sunset. But Tuesday night, the man who killed the elderly McIntosh County couple died himself, the 14th inmate executed in Oklahoma this year. Harold Loyd McElmurry III was pronounced dead at 6:06 p.m., executed for the Aug. 1, 1999, murders of Robert and Vivian Pendley at the couple's Lenna home. "They were good, hard working, honest people," Diana Pendley said of her parents-in-law. She, her husband Bob, son Robert and Robert's wife Sheila witnessed the execution Tuesday night. Murder victim Robert Pendley had survived many things in his life, from fighting in the Battle of the Bulge with the 87th Infantry Division in World War II to surviving a crippling fall more than three decades later. Robert and Vivian Pendley lived much of their lives in Eufaula, but in the 1970s they decided to build a retirement home in Lenna some miles west of the city where he ran a garage and she worked in a department store. In 1976, while working on the second story of the house, Robert Pendley fell and broke his back, leaving him paralyzed from the waist down. That's when Vivian quit working at Sharp's Department Store in Eufaula, a job she'd held for 25 years, to stay home with her husband. Both were then in their 50s. The veteran didn't let the fact he could no longer use his legs stop him, however. He worked to develop his upper body strength until he could move himself to and from his wheelchair unassisted. "He could lift himself out of his wheelchair onto his riding lawnmower," Diana Pendley recalled. "They had a recliner in the living room and he'd lift himself into it to watch a little TV at night." Robert Pendley would hang tools from his riding mower and go around the couple's property trimming and cleaning. Vivian Pendley also spent a lot of time transforming the property into what members of the Eufaula High School class of 1963, who once held a reunion there, said "looked like a park." "Mom was just a workhorse. She was going all the time," Diana Pendley said. "Their home was their pride and joy. Mom and Dad both took great pride in their yard." Gradually, the couple cleared the land around their house until the yard alone encompassed several acres. The couple first met their killers while having more yard work done. In 1999, Robert Pendley was 80 years old and Vivian was 75. Although the couple remained active, both for work and for pleasure - once riding a four-wheeled all terrain vehicle the 24 miles from Lenna to Hanna - there were some things they just could no longer do. Some weeks before they died, the couple hired a man to clear some land so they could see the sunset better. At one point the man came to work along with two people who had been living with him, Harold and Vickie McElmurry, who asked if they could help. The Pendleys put them to work as well. Several weeks after the work was done, the McElmurrys returned. According to court documents, they spent two days walking through the woods to reach the Pendley home. Once there, the McElmurrys visited with the elderly couple, then retreated to the woods. Harold McElmurry testified in a preliminary hearing that he and his wife "shot up" with methamphetamine while trying to decide whether to rob and kill the Pendleys or simply rob them. Court documents indicate the McElmurrys returned to the home, finding the elderly couple in the garage. While Vickie McElmurry lured Vivian Pendley away, Harold McElmurry attacked Robert Pendley, stabbing him multiple times with a pair of scissors before beating him with garden instruments and a pipe. Vivian Pendley was also beaten and stabbed. The McElmurrys fled with two pistols, $70 cash and the Pendleys' 12-year-old Oldsmobile, crossing the border into Mexico for several days. They were captured when crossing back into the United States near Laredo, Texas, and returned to Oklahoma. McElmurry waived his appeals, asking for an execution date. In a letter to the attorney general's office dated June 16, 2002, McElmurry wrote "There is no question as to my guilt and I feel competent to make this decision." Vickie McElmurry is serving two life sentences for her part in the crime. Tuesday Harold McElmurry raised his head as the blinds to the state's execution chamber rose. He gave a perfunctory glance at the four reporters gathered in the witness room, then seemed to dismiss them as he returned his head to the gurney on which he was strapped. "I'd like to say I'm sorry to the Pendley family," he said, staring at the ceiling. "I hope they can forgive me." Less than two minutes later he was dead. The murder victims' grandson said he believed McElmurry's apology was sincere. "I forgave Harold about three weeks ago," Robert Pendley Jr. said after the execution. "It was kind of a hard thing to do, just knowing the brutality of the crime he had committed. "I felt like with Harold making the decision he had made tonight (waiving all remaining appeals), I felt like I needed to do that." OKLAHOMA CITY, Oklahoma (Reuters) -- An Oklahoma man who beat and stabbed an elderly couple to death during a 1999 robbery was executed by lethal injection Tuesday. 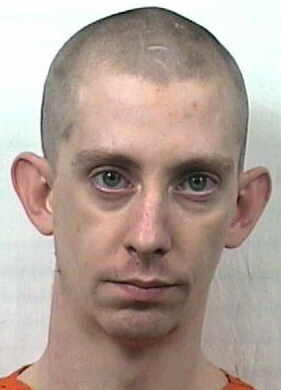 Harold McElmurry III, 33, was the fifth person put to death this month in Oklahoma and the 14th this year. He was executed for the murder of wheelchair-bound Robert Pendley, 80, and his wife, Rosa, 75, at their residence in Leanna, Oklahoma. McElmurry told police he stabbed the couple with scissors, then beat them with a hoe. He and wife, Vickie, then took the couple's car and fled to Mexico. They were arrested when they tried to cross the border back into the United States. Vickie McElmurry is serving a sentence of life without parole. McElmurry's last words, uttered while he was strapped to a gurney in the death chamber at the state prison in McAlester, were, "I'd like to say I'm sorry to the Pendleys. I hope they can forgive me," according to prison spokesman Jerry Massie. For his last meal, McElmurry requested Canadian bacon pizza, a pint of chicken livers, cottage cheese and one raw white onion. He was the 68th person put to death in Oklahoma since the state resumed capital punishment in 1990 after a national death penalty ban was lifted by the U.S. Supreme Court in 1976. OKLAHOMA CITY (AP) -- The execution of Harold Loyd McElmurry might not ease the pain, but it will bring a sense of relief to relatives of a rural McIntosh County couple viciously slain in 1999. "We won't have to worry about him getting out and doing that to someone else,'' said Diana Pendley, daughter-in-law of Robert and Vivian Pendley. The Pendleys were murdered during a robbery at their home in the tiny community of Lenna, about 10 miles west of Eufaula. "If you can imagine your world being shattered, that's what it's been like,'' Diana Pendley said. McElmurry, 33, is the fifth person scheduled to be executed by drug injection at the Oklahoma State Penitentiary this month. His wife, Vickie, is serving two life sentences for her part in the crime. Robert Pendley, 80, was in a wheelchair when he was stabbed several times with a pair of scissors. He was then knocked from his wheelchair and beaten with garden tools and an iron pipe. After Vivian Pendley tried to escape, investigators said McElmurry had his wife catch and hold the 75-year-old woman while he beat her to death. "It was a very horrific death. No one should have to go out like that,'' said Diana Pendley, wife of Robert Pendley, one of the couple's two sons. She said the elder Pendley had become a paraplegic when he fell from a scaffold while building the couple's home. "They took pride in their home. It had a three-acre yard that was like a park. They manicured it like you wouldn't believe.'' Investigators said robbery was the motive for the crime. The killers got off with the family car, two pistols and about $70. They were captured in Texas near the Mexican border. McElmurry's execution is set just three years after he was convicted. The Oklahoma Court of Criminal Appeals twice denied bids to escape prosecution in 2003 and McElmurry waived one appeal to the U.S. Supreme Court. For his last meal, McElmurry ordered a medium Canadian bacon pizza, a pint of chicken livers, a pint of cottage cheese and an onion. His execution would be the 14th this year in Oklahoma, tying the number of executions in the state in 1933. That record stood until 18 people were put to death in 2001. McIntosh County prosecutors will seek the death penalty for a couple accused of killing an elderly Lenna woman and her paraplegic husband. The district attorneys office filed a motion Wednesday seeking the punishment against Harold and Vickie McElmurry, who allegedly beat and stabbed Vivian Pendley, 75, and her 80-year-old husband, Robert, in their home about 10 miles west of Eufaula. The bodies of the Pendleys, who had previously hired the McElmurrys to do yard work on their 80-acre property, were found Aug. 2. The McElmurrys face 2 counts of 1st-degree murder, Assistant District Attorney Phil Cozzoni said. District Judge Steven Taylor set the date for the McElmurrys' trial for April. Taylor overruled a motion filed by defense attorney Wes Gibson to have the case remanded for a further preliminary hearing. Gibson said he filed the motion because at the Jan. 5 hearing, Associate District Judge Gene Mowery denied his request to have Harold McElmurry testify on behalf of his wife, whom Gibson represents. After the hearing, Gibson said Harold McElmurry had told his wife from the outset that he was going to exonerate her and that he wanted to get on the stand to say he did it all. "I'm not sure what Im going to do with that at this point," Gibson said Thursday. "I may file a writ on that issue." The McElmurrys went to the Pendley's home because they needed transportation and money, Texas Ranger Doyle Holdridge testified. Holdridge said Harold McElmurry told him McElmurry stabbed Pendley with scissors several times - knocking him out of his wheelchair - before bludgeoning him with a hoe and pounding the man with a steel pipe. Mrs. Pendley tried to run but was stopped, Holdridge testified. He said McElmurry told him he stabbed and beat Mrs. Pendley. Chief Deputy Meme Martinez of Webb County, Texas, testified in December that Vickie McElmurry confessed to him that she had hit Pendley on the head with a pipe and had choked Mrs. Pendley until McElmurry could stab her. After the slayings, the McElmurrys allegedly stole the Pendley's car and fled to Mexico. They were arrested at a Laredo border crossing as they attempted to drive back into the United States. EUFAULA (AP) -- A McIntosh County jail escapee was recaptured Monday morning in time for his double murder trial. Officials said Harold McElmurry III, 30, was taken into custody about 6 a.m. when he was spotted in front of the Eufaula City Hall by Eufaula Police Chief Randy Johnson. Potential jurors began arriving for selection in his trial just hours later. A court official said the trial would proceed as scheduled Monday morning. McElmurry slid through the barred window of his second-floor cell and jumped 12 feet to the ground about 10:15 p.m. Saturday, McIntosh County sheriff's officials said. The fugitive was in the jail awaiting trial for the August 1999 slayings of an elderly Lenna couple who hired McElmurry and his wife, Vickie, to do lawn work. Vickie McElmurry is in jail awaiting trial. Prosecutors are seeking the death penalty for the McElmurrys, who are being tried separately because of their opposing defenses. McElmurry allegedly stabbed 80-year-old Robert Pendley, a wheelchair-bound paraplegic, several times with a pair of scissors and bludgeoned him with a steel pipe, according to reports. Vickie McElmurry allegedly choked Vivian Pendley, 75, until Harold McElmurry stabbed the woman and dragged her body into the garage, investigators said. Defendant was convicted by jury in the District Court, McIntosh County, Steven W. Taylor, J., of two counts of first degree murder with malice aforethought, one count of robbery with a dangerous weapon, and one count of larceny of a motor vehicle. Defendant appealed his death sentence. The Court of Criminal Appeals, Lile, J., held that: (1) defendant failed to show he was prejudiced by transcript's occasional failure to identify prospective jurors who were being addressed or who were responding to questions of judge or counsel; (2) prosecutor was entitled to use defendant's prior statements against him, even if prosecutor knew that defendant was lying to protect his wife; (3) expert testimony regarding victims' experience of pain prior to death was relevant; (4) convictions did not violate double jeopardy; (5) evidence supported aggravating circumstances; (6) defendant was not prejudiced by any improper statements and argument made by prosecution; and (7) defendant was not entitled to supplement record on appeal with extra-record evidence or to have an evidentiary hearing on his ineffective assistance claims. Affirmed. Chapel, J., concurred in results. 4. At the present time there exists a probability that the defendant will commit criminal acts of violence that would constitute a continuing threat to society. The trial court imposed judgment and sentence on June 16, 2000, and set punishment on each charge in accordance with the jury verdicts. [FN5] The trial court ordered the Twenty (20) Year Sentence in Case No. CF-1999-153A, Larceny of a Motor Vehicle, to run concurrently with the One Hundred (100) Year Sentence in Case No. CF-1999-154A, Count 3, Robbery with a Dangerous Weapon. Appellant has filed his direct appeal in this Court from these judgments and sentences. FN5. Appellant was charged conjointly in these cases with his wife, Vickie McElmurry, except that she was charged with two counts of First Degree Felony Murder rather than First Degree Malice Aforethought Murder. The Defendants' cases were severed for purposes of trial, and Appellant was tried first. Robert and Vivian Pendley lived in a rural area west of Eufaula. Appellant and his wife, Co-Defendant Vickie McElmurry, had previously done yard work for the Pendleys. During the two or three weeks since he had last worked for them, Appellant had been thinking about robbing and murdering them, and had been discussing his plan with Vickie. Robert Pendley was eighty years old, and in a wheelchair. His wife, Vivian Pendley, was seventy-five years old. Appellant believed there was a warrant out for his *14 arrest on a probation violation and that he would likely go to prison. He had lost his job, had little money, and could not get a tag for a car he had bought. He assumed the Pendleys had a lot of money, and he knew they had a car. He said he needed the money and needed something to get on with his life. So he decided to rob, or rob and murder, the Pendleys. On Friday, July 30, 1999, Appellant and his wife began a two-day journey on foot to the Pendley residence. They stopped at Mark's Country Store approximately one mile west of Eufaula on July 30 to buy some groceries. Then they continued on to the Pendleys' through the woods, so they would not be seen. Upon arriving at the Pendley residence on Sunday afternoon, August 1, the Defendants knocked on the Pendley's door and were invited into their home. The Defendants and the Pendleys moved outside because the Defendants were smoking cigarettes. After a while, the Appellant and Vickey left the Pendley residence and walked around in a wooded area across the road for one or two hours, trying to decide whether to rob, or to rob and murder, the Pendleys. Appellant says he told his wife, "I wanted to kill them but I didn't feel right about it. I didn't care for Vivian much, but I liked Robert. Robert was always real nice to me." Appellant did not mention drugs in his statements to police when he was arrested, but when he testified at the preliminary hearing several months later, he claimed that he and his wife each shot-up or injected "a little bit of crank," or methamphetamine, 30 or 40 minutes before returning to the Pendleys' house. Appellant admitted that he knew what he was doing and knew that he was going to rob the Pendley's when he went back over to their house. He said there wasn't any question in his mind about it. When the Defendants returned to the residence, the Pendleys came out into the garage. Appellant and Robert Pendley remained there while Vivian Pendley and Vickie McElmurry walked out into the backyard. McElmurry said in his written statement August 6, 1999: "Vivian and Vickie were away [from] the house, and I decided to go ahead and kill Robert. Robert and I were in the garage. I had picked up some scissors in the house that I intended to use to kill Robert. All of a sudden I pulled out the scissors and stabbed Robert 6 or 7 times in the chest while he was sitting in his chair. He fell out of the chair and I hit him in the head with a hoe two or three times." Appellant only stopped when the hoe handle broke. Rows of puncture wounds were also found later on Mr. Pendley's back which were consistent with multiple blows from the metal tines of a garden rake that was found in the garage. Vivian Pendley walked into view and saw what Appellant was doing to her husband. When Vivian started to run, Appellant yelled to Vickie to hold her until he could get there. He stabbed Vivian repeatedly and then dragged her into the garage, leaving a bloody trail that led up to her body. Appellant then discovered that Robert was still alive and picked up a three-foot pipe and began hitting him in the head until his skull was shattered. Then, seeing that Vivian was still alive, he beat her with the iron pipe until her skull was also shattered. The Defendants took seventy dollars, some costume jewelry, the car keys, and two handguns, including a German Lugar pistol, and fled the scene in the Pendleys' Oldsmobile. After spending a day in Houston, Texas, they drove to old Mexico where they stayed two or three days. On August 5, 1999, they crossed the border from Mexico back into the United States near Laredo, Texas. Peter Brewster, a United States Immigration officer, testified that Appellant was driving the Pendleys' car when it crossed the bridge into the United States. Vickie McElmurry was a passenger in the car. After Appellant was taken into custody, he gave statements to Texas Ranger Doyle Holdridge. Appellant confessed to Holdridge that he murdered the Pendleys, robbed them, and took their car. The medical examiner, Dr. Donald Distefano, testified that both Vivian Pendley and Robert Pendley died as a result of multiple blunt and sharp force injuries. Additional facts will be presented where relevant to specific propositions of error.